Sting played a memorable two-hour concert performance to a near full Stadium Georgi Asparuhov. The musicians took to the stage exactly at 20:30pm to warm applause of the audience. Together with the Philharmonic, he performed a total of 23 songs, covering all periods of his career. But because of their orchestral arrangement, they were presented in a completely new light. So familiar songs like 'If I Ever Lose My Faith In You', 'Englishman In New York' and 'Every Breath You Take' had a more optimistic tone, while 'Roxanne', one of the iconic singles of his former group The Police, was a more melancholic version approaching the cover by George Michael. Sting opened the show with 'Every Little Thing She Does Is Magic', and in the first part of the show performed songs including 'Russians', remembered his father in 'Why Should I Cry For You' and, the expected 'When We Dance' and 'Fields of Gold'. In the pauses between songs Sting introduced the members of the orchestra and his band, and he showed a more light hearted mood, which was never at the expense of the seriousness of his performance. Sting announced in Bulgarian that there would be a 20-minute interlude and the second part of the performance began with the 'Shape of My Heart', one of the most emotional performances and warmly greeted songs of the evening. ''This is a song about a vampire,'' said the singer born Gordon Sumner before 'Moon Over Bourbon Street'. 'All Would Envy' was introduced as a song about the love between an older man and younger woman. The second part of the evening ended with 'Every Breath You Take', but the musicians did not leave the audience waiting long for an encore. 'Desert Rose' had of thousands of spectators on thei feet, and the concert ended with an acoustic performance by Sting of the Police song 'Message In A Bottle'. This is the second concert by Sting with the Philharmonic, the first was when the musicians performed with him in Bucharest. Sting was also joined by longtime guitarist and co-writer of 'Shape of My Heart' Dominic Miller, who earlier this year a concert in Sofia with his solo band. Tonight's event was Sting's third concert in Bulgaria after his visit in 1996 to Sofia and Nessebar ten years later. If the previous two Sting concerts in Bulgaria were legendary, the third certainly will not be forgotten - not least because of the bonus acoustic version of 'Message in a Bottle' the musician gave at at the every end of his performance in Sofia organized by Sofia Music Enterprises. Under the rays of the setting sun Sting appeared to be in excellent spirits on the stage which was filled from side to side by musicians from the Philharmonic. Wearing a simple black shirt and jeans he performed the second concert of the European part of his 'Symphonicity' tour, the latest in an excellent solo career that has lasted more than a quarter century, during which he has sold more than 100 million albums, many of them platinum, and received an impressive number of hits and awards. Immediately after the first song 'Every Little Thing She Does Is Magic' he followed up with 'If I Ever Lose My Faith In You'. Unlike previous visits, this time Sting surprised his fans by trying to speak Bulgarian. ''Good evening, Sofia!'' he said to the audience of around twenty thousand who had come to the Stadium Georgi Asparuhov for the show and added he was particularly proud that behind him was a large Bulgarian orchestra. 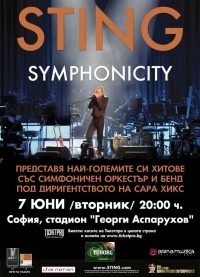 The Sofia Philharmonic was conducted on this occasion by the young Sarah Hicks and supplemented with musicians Sting, guitarist Dominic Miller, who visited the capital several days ago for a solo show, percussionist Rhani Krija and bassist Ira Coleman. With their help Sting presented an exciting journey into his hits from the Police era to today. The impressive mix of twenty three songs included his big hits - 'Englishman in New York', 'Mad About You', 'Roxanne', 'When We Dance', 'Fields of Gold' and 'Shape of My Heart', and the deeply personal 'Why Should I Cry For You', dedicated to the memory of his father, and 'King of Pain'. The idea of ​​the whole tour is in the distinctive sound created by the great Philharmonic Orchestra. Slowly but surely Sting led the audience towards the inevitable finale, which this time was 'Every Breath You Take' It was here that the concept of the 'Symphonicity' tour was superbly highlighted, and was rewarded with the tumultuous applause of the audience who were on their feet, singing all three final songs - 'Desert Rose', 'She's Too Good For Me' and 'Fragile'. Sting was incredible!What a power,what a voice!? Sting thank you!